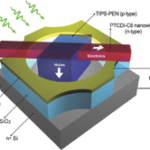 Organic semiconductor, due to their excellent interaction with light, could be made into photosensors. 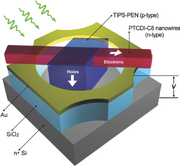 The scientists of the Laboratory of Organic Physics have been working together with colleagues from University of Strasbourg and CNR Bologna on novel forms of photonic devices. In these, crystalline dioctyl-3,4,9,10-perylenedicarboximide nanowires and 6,13-bis(triisopropylsilylethynyl) pentacene microplates are integrated into a vertical-yet-open asymmetrical heterojunction for the realization of a high-performance organic photovoltaic detector, which shows fast photoresponse, ultrahigh signal-to-noise ratio, and high sensitivity to weak light. The results are published in Advanced Materials.